Most of chapter 42 and all of 43 are devoted to praising God for his creation, including specific references to the sun, moon, stars, rainbows, the wide variety of weather patterns, and the sea with its tides and monsters. These are all aspects of nature praised in the Psalms and other parts of the Jewish scriptures. Perhaps they are picked out from the other aspects of creation because they are least easily understood – before modern astronomy, physics and submarines, who could explain how they work? It is important to note that there is no hint here of worshipping these phenomena themselves. Jewish and Christian thought is absolutely clear that there is only one god, the creator, and all these things are from him, having no spiritual life of their own. The praise is directed to God in thanks for the wonder of the creation. “To put it concisely, ‘he is all’” (43:27). We are in fact encouraged to praise God as much as possible, for it can never be enough – “exert all your strength when you exalt him, do not grow tired – you will never come to the end” (43:30). Such praise of God for the beauty of nature would have come more easily to people in former times than it does to us nowadays. Shielded by artificial lights from seeing the night sky in its glory, having the mysteries of the climate explained by science, having “no time to stand and stare … beneath the boughs” as William Davies put it, we lose our childlike capacity for wonder. Perhaps the rainbow is the one exception. No matter that scientists can explain them in terms of refraction and diffraction, rainbows lighting up with their glorious colours can still make a dull day fascinating and cheer the soul. “See the rainbow and praise its maker, so superbly beautiful is its splendour. Across the sky it forms a glorious arc, drawn by the hand of the Most High” (43:11-12). I noted yesterday that Psalm 90 invites us to consider how God is timeless, making no distinction between the most ephemeral and most long-lasting things in creation. If that is so, then he is also sizeless, intimately involved with the complexity of the world at its miniscule scale, as well as a cosmic level. That is not obvious from Psalms 96 to 100. The Lord is understood here to be a powerful being totally in control of the world, though somewhat detached from it in his “sanctuary” or “courts”. This is understandable when you remember that the composers of these songs lived in a world with sharp division between rulers and ruled, and with a not unreasonable assumption that the world was at the centre of God’s creation. Despite massive shifts in politics and science in the last 3000 years, many people’s understanding of God is still of “him up there”. But many thinking Christians would now reject the notion of God being physically remote from the world, rather he (or s/he if you prefer) is “here and now” – always and everywhere. The other thing to note about these psalms (96-100) is that they are all songs of praise to God, with hardly a hint of personal problems (unlike 102, or many of the other psalms). 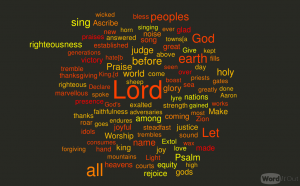 This word cloud worditout.com/word-cloud/2299907 shows that Lord, God, earth, peoples, praise, and righteousness are the most commonly used. Sometimes we have to set aside our problems and devote ourselves to positive activities such as singing (including praising God) or giving attention to other people (showing practical love). For people of faith, that is not just about a feel-good factor or boosting endorphins, it is connecting with the ever-present God. Psalm 90 is unlike most of the others. For a start, it is described in the heading as a prayer rather than a song, and attributed to Moses rather than to David or one of his contemporaries. Presumably by their time (several hundred years after Moses) it had been handed down orally before being written down and set to music. Also, it seems quite different in its theme, more in line with the “wisdom books” of the Bible such as Ecclesiastes. If Moses did compose it himself, it may have been at the end of his long life, looking back on the generations he had seen born and die in Egypt and then in the wilderness. He considers how even a long human life – 70 or 80 years – is a mere moment in God’s eyes, as fleeting as dust, and “a thousand years are as a day”. In fact, if God is eternal, the creator of time itself, then there is no difference to God between the nanosecond lifespan of the most unstable atom, and the several-billion-year existence of a star. What matters, says Moses, is not quantity of life but quality. The life of 80 years may be “all toil and trouble” (v.10), but more important is that we ask God to “satisfy us in the morning with your steadfast love, so that we may rejoice and be glad all our days” (v.14). He is concerned more for the next generation (v.16) than his own. Psalm 91 is about God’s protection, and includes the image of God guarding us under his wings. 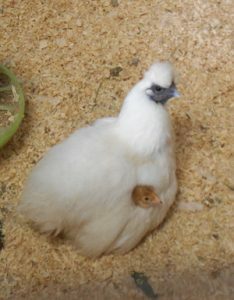 Surely that should be “her wings” – it is the mother bird who protects her young, as I saw only recently with this 2-week-old-chick. Even so, it is hard to have faith that “Because you have made the Lord your refuge … no evil shall befall you” (v.9-10), as experience shows that people of faith suffer no less than others. Even Jesus, when he was tempted by the Devil to put into practice verses 11-12 “For he will command his angels concerning you to guard you … so that you will not dash your foot against a stone”, he sent the Devil packing with a retort that we must not put God to the test. God’s protection is not to be treated link a cloak of invisibility or some other super-power, but rather about him not letting anything destroy what really matters – faith itself. Psalm 94 has a similar theme, that true wisdom takes the long view that faith and obedience are a better way of achieving long-term justice and peace than going along with short-sighted fools in violence and short-term gain. But Psalms 92, 93, and 95 are joyful songs of praise. In fact Psalm 95, known from its opening word as the “Venite” (“come!”) is still said or sung at morning prayer every day in the Anglican tradition.